With “men only” (October 2010) BBB Johannes Deimling has started a series of performance art events with a special focus on Performance art practices. 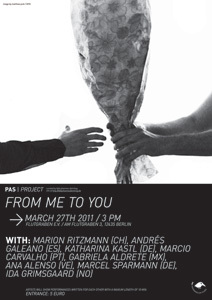 The next performance art afternoon with the title "FROM ME TO YOU" will focus on a specific idea of cooperation. 8 young international artists are invited to write a performance for one of the other artists. The audience will see 8 performances performed not by the author of the piece. The artists have been in contact with each other to find ideas for the concept. It’s not about to show an individual piece, it’s more about to draw attention and respect to the work, the person and to understand the process of creation in a different way. Each performance will not be any longer than 10 minutes. During the breaks we will serve coffee, tea and cake. The event is financed by PAS│Performance Art Studies and will be documented by Matthias Pick (photo) and Christopher Hewitt (video).